To provide a sense of security to the tourists visiting the State and give them a feeling of being welcomed, Chief Minister (CM) Pema Khandu on Friday launched the ‘Arunachal Tourist Police’ and ‘Arunachal Suraksha App’ in presence of Home Minister Kumar Waii, Chief Secretary Satya Gopal and Director General of Police (DGP) SBK Singh. Khandu, in his speech, welcomed the initiative by Arunachal Police to make Arunachal a tourist-friendly State. He informed that the ‘Tourist Police Unit’ is being launched in seven districts equipped with specially designed Scorpio vehicle. These units are currently deployed in Tawang, Itanagar, Ziro, Roing, Pasighat, Namsai and Pangsau Pass. Khandu said he hopes that the tourist police unit will discharge their duty effectively and with dedication. He said the tourist police personnel are trained in soft skills, communication skills and equipped with knowledge of the tourist places. He requested the police unit to be vigilant in coming to aid to any distressed call. To complement the efforts of the unit, users can download the Suraksha App and through it can know the nearest police station and use a button to make direct call to the police. Further, the CM said the State Government will put in every effort to make the tourist police unit effective and assured to provide more number of vehicles, personnel and equipment. Home Minister Waii in his speech said the new tourist police unit will be a game changer and stated that if Arunachal can harness its tourism potential, the State will be the most prosperous one in the country. 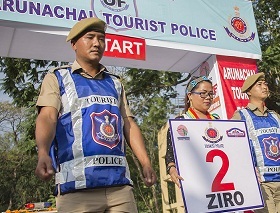 He further said that the safety and comfort of tourists depends not only on police but also on the local community and urged them to come forward in making Arunachal safe and friendly for tourists. Chief Secretary and DGP Singh also spoke on the occasion. The CM later flagged off 16 Scorpio vehicles of the Tourist Police Unit. Top officers from the Indo-Tibetan Border Police (ITBP) and Sashastra Seema Bal (SSB) were also present on the occasion.